Love Larabars! My fav is the Peanut butter cookie. Love Larabars! My fav kind is the Peanut Butter Cookie. Key Lime flavour is superior to all others! It is like a lime juicing in your mouth and the best way to perk up a flight, long day of law classes, or even to chop up and mix with Greek yogurt after a long run. 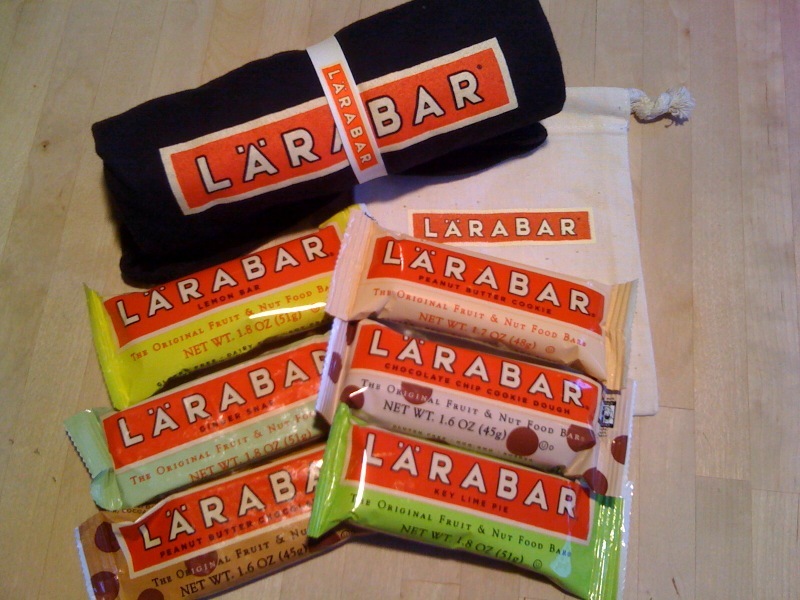 My favorite is LÄRABAR Cherry Pie :) *Thanks* for the giveaway! Larabar flavors pretty much encompass anything you might crave, though personally I'm partial to the fruit flavors. How about a raspberry version - inspired by a spicy chewy raspberry dessert bar Celiacs might otherwise only dream of? I like the PB & J flavor! May Canadians enter? My favourite Larabar flavour so far is Pecan Pie (but I haven't yet tried any of the ones you chose for the giveaway). Yes, we love it, Stephen! Favorite flavor is PB chocolate chip. My favorite flavor is Cherry Pie. I like Tropical Fruit Tart. My dream flavor would be Lemon-Cherry! My favorite it is the Peanut Butter Chocolate Chip!! It is the best by far, although I love all the other flavors as well. I would like to see a Banana Bread with Chocolate Chip flavor, as well as Strawberry Shortcake and maybe a Sugar Cookie flavor?? My favorite is the chocolate chip cookie dough! YUM! My two favorite flavors are the Lemon Bar (so fresh and lemony tasting) and Cherry Pie. I haven't tried everything yet, not by a long shot and I can't wait to try more flavors. My favorite is the apple :) If I could create a new flavor it would be mango??? Larabars are a Celiacs survival "MUST HAVE"! I always have at least one in my purse (Key lime Pie) and two in the car console. FYI after a long day of work, when I climb in the car, then get stuck in traffic, I open the console and there is a soft warm Larabar waiting patiently for me to devour it, so delicious at car temp! The only thing better than Key Lime Pie flavor would be CHOCOLATE RASPBERRY!!!!!!! Please and thank you! Larabars got me through my first year of college and they're still my favorite pre-gym snack. Best flavor: Coconut cream pie!